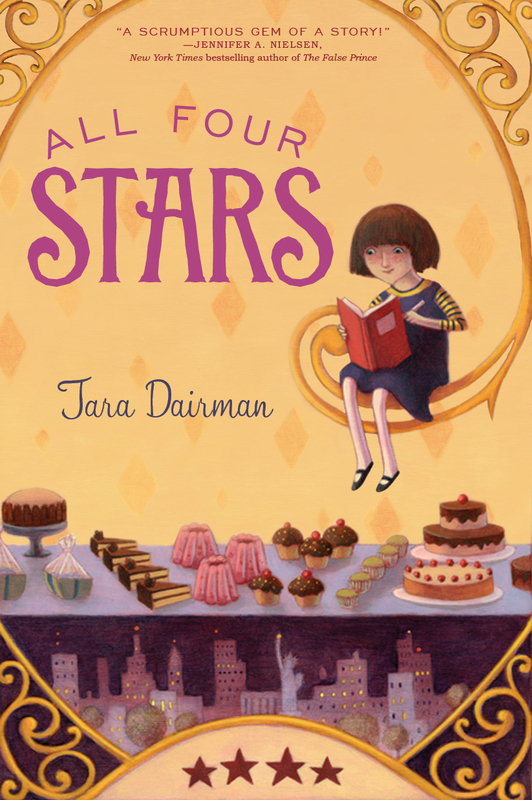 In the Southwest division, the 2015 Crystal Kite Award goes to "All Four Stars" by SCBWI Rocky Mountain member Tara Dairman! 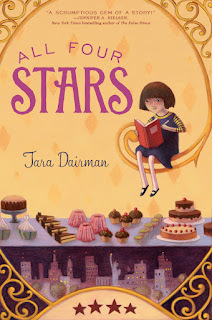 Tara: ALL FOUR STARS is a middle-grade novel about 11-year-old foodie Gladys Gatsby, who secretly becomes a restaurant critic for New York's biggest newspaper. It's my first novel (though it was a nine-year process to get from first words of the first draft to publication day!). Believe it or not, it was inspired a bit by real life; I used to work as a magazine editor in New York, and I published pieces by a lot of freelance writers that I never met in person or even talked to on the phone. All of our communicating would be done by e-mail. So it struck me one day that a kid who was a really good writer could probably hoodwink me into publishing her, and voilà: the premise for ALL FOUR STARS was born. 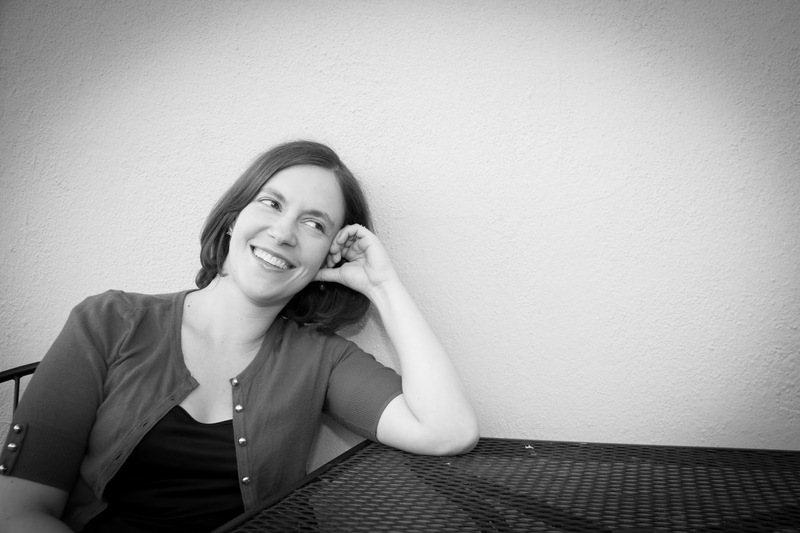 Tara: I joined SCBWI in 2013, after I'd been offered a book deal for ALL FOUR STARS but before it was published. I attended my first regional conference in Denver that fall, and have been involved in the organization since. I especially love attending our local "schmooze"* meetings in Boulder, which are a less formal way to connect with fellow writers at all stages of the writing and publishing process. I love the many opportunities SCBWI has given me to learn from my published peers, who have been so generous about speaking on panels and presenting at conferences. I've also had the pleasure of speaking at a couple of local gatherings and sharing what I've learned about publishing with writers who may be working on their first books or just getting ready to query agents. The children's literature community--and SCBWI in particular--is so incredibly supportive. I wish that I had known about it and joined up when I was just starting out, but I'm happy to be a part of it now. Tara: Reading is the best education. Read widely in whatever genre you're working in, especially recently published titles--it will help you understand what's selling now. Read to the point where the nuts and bolts of storytelling become innate for you. Also, if you don't already have one, try to form a critique group, and meet regularly. Your first responsibility to a creative project is to finish it, and feedback and encouragement from your peers can go a long way toward making that happen. I first met Tara at one of our fall conferences before All Four Stars released and have gotten to know her better recently--she is absolutely lovely! Ever since our first meeting with each other she has slowly started to get more and more involved and connected into the SCBWI community here in the Rocky Mountains She has been active at the Boulder Schmoozes (now called Connect), participating most recently in a panel about how members found their agents. The Rocky Mountain Chapter is one of the largest and, having just celebrated our 39th anniversary, one of the oldest in the SCBWI community. Supporting a large geographic area consisting of over 600 members across Colorado and Wyoming poses a challenge. But more than 20 volunteers and nearly 120 P.A.L. members help provide the backbone of the region. P.A.L. members are called upon and so graciously agree to serve as mentors in our Mentorship Program and promote local authors and illustrators along with our organization at other literary and education events such as the Colorado Teen Lit Conference and our regional council of the International Reading Association. We also call upon them to teach at chapter events both locally and on a larger scale including our Fall Letters & Lines Conference as well as at the Big Sur in the Rockies workshop in partnership with the Andrea Brown Literary Agency. We are also very proud of our creative communities within the larger chapter community. Local Area Coordinators host regular Connect gatherings throughout the region from Denver, Fort Collins, and Boulder to Grand Junction, Pueblo and Colorado Spring with a brand new volunteer coming on to host in Cheyenne. Learn more about Tara at her website here. And discover more about SCBWI Rocky Mountain at their online home here. Congratulations again to Tara on "All Four Stars" winning the 2015 Crystal Kite Award! 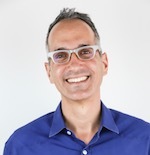 *note: Schmoozes are now called "Mingles"and in some areas "connect" and while the names may have changed, the warmth and gathering of our kid lit community has not! Congratulations again, Tara! It was a pleasure hearing your award acceptance speech here in Denver.